Manila supports a substantial market for live, fresh, frozen, cured fish and canned fishery products. The Metropolitan Manila Area (MMA) was established in 1975 through Presidential Decree 824 and amended by Presidential Decree 1396, which established this geographical area as the National Capital Region (NCR). Under the administration of the Metropolitan Manila Development Authority, the NCR comprises the following cities: Manila, Quezon City, Caloocan, Pasay, Mandaluyong, Pasig, Makati, Muntinlupa, Marikina, and Las Piñas. Currently the NCR is administratively divided into seven municipalities, namely: Malabon, Navotas, Parañaque, Pateros, San Juan, Taguig and Valenzuela, with an estimated population of 10.4 million in 2000, which represents about 12.8 percent of the countrys total population. According to latest estimates, the total projected population of the Philippines for 2000 is about 81 million. Under the 1991 Local Government Code, the City Council of Metro Manila was granted local autonomy and regulatory powers concerning basic city services, and enforcement of inspection of food products and urban sanitation. It is also in charge of policy formulation and supervision of retail food markets and street food vending. In 1997, FAO fisheries statistics reported an apparent annual per capita fish supply of 31.7 kg in the Philippines. Currently the Philippines, Malaysia and Singapore have the highest per capita supply of fish in the ASEAN region. A breakdown of the annual per capita supply of fish for the Philippines in 1997 is shown in Table 3. ASEAN countries, particularly the Philippines, Singapore and Malaysia, offer a strong regional fish and fishery products market with significant fish imports. The Philippines is by far the major importer of small pelagics, either frozen (sardine, sardinella, mackerel and round scad), fish meal (mainly sardine, anchovy and mackerels) or canned (mainly sardines in tomato sauce). Japan and Russia are the main suppliers of frozen small pelagics and over 80 percent of the fishmeal comes from Chile and Peru. In 1997, the total imports of fishery products were 295,015 metric tonnes with a FOB value of US$ 138.1 million. The total exports of fishery products for the same period were 173,887 metric tonnes with a FOB value of US$ 549.8 million. In 1999, official statistics showed that the countrys total fish catches were 2.86 million metric tonnes, with 34.2 percent coming from aquaculture production, 33.3 percent from commercial fishing and 32.5 percent from small-scale fishing. The domestic market for fish and fishery products is distinguished principally by the dependence on supplies from aquaculture, small-scale fisheries and commercial fisheries. It should be noted that a significant proportion of aquaculture produce, particularly shrimp, is exported. Both freshwater and marine fish and fishery products are regularly being traded in Metro Manilas domestic seafood market. Fish and fishery products are staple foods in the Filipino diet, and constitute the main source of animal protein. Chilled and live seafood is landed at the main Metro Manila fishing port, namely Navotas Fishing Port Complex (NFPC), which handles about 260,000 to 280,000 metric tonnes of fish annually. The Philippines Fisheries Development Authority (PFDA) is in charge of the management and operation of NFPC and of monitoring and compilation of fishery statistics and related fish marketing information. Average daily volumes of seafood landed in Navotas FPC vary according to the fishing season from about 430 to 980 metric tonnes. Navotas FPC is equipped with two main trading halls with a market floor area of 8,320 m2, on which the brokers or commission agents display and trade fish. Fish at the wholesale marketing halls is sold mainly by secret bidding (whispering) in a public auction conducted by brokers, who sell to retailers, institutional buyers, processors and seafood traders. The wholesale market halls operate regularly at night from about 20:00 hours to 03:00 hours. During 10:00 hours to 13:00 hours, wholesale/retail marketing operations are also conducted at Navotas auction halls for fish coming from small-scale fisheries and aquaculture farms. However, some of the fish and shellfish coming from other landing places or fish farms, do not go through the Navotas auction halls, but are sold through wholesale trade at the Divisoria Central Market, Metro Manilas major food wholesale market, and Pasig wholesale market (mainly dealing with cultured brackishwater fish coming from the Laguna de Bay area). There is a significant domestic live fish trade, a portion of which does not go through the auction, but are handled by private wholesalers. These wholesalers usually operate small live fish carrier trucks (with tanks and aeration systems), collecting live milkfish (Chanos chanos), groupers and freshwater fish (tilapia, catfish, snakehead) produced by aquaculture farms. Domestic live shellfish trade comprises molluscs such as cultivated green mussel (Perna viridis) and oyster (Crassostrea spp. ); crustaceans include mangrove crabs (Scylla spp.). These live shellfish are regularly distributed in the Philippines using air, sea and road transport; supplies come from brackishwater ponds and small-scale fisheries. Most of the production of oysters and green mussels are sold alive and a relatively limited proportion is sold as shucked flesh, either fresh or salted. There is a very limited export trade of frozen, chilled and dried oysters to Hong Kong and Singapore. Oysters and green mussel farm operators usually sell their production either through middlemen wholesalers or to a lesser extent, by direct retailing. Mussels and oysters are generally packed and distributed in woven plastic bags (usually holding about 30 kg) and traditional vegetable fibre baskets (locally known as kaing), holding about 20 - 25 kg. There is also a significant export trade of live reef fish, particularly groupers, with supplies coming from capture fisheries. Export markets for live groupers include Hong Kong and Singapore. The domestic market is growing, but is limited mainly to Chinese restaurants. Current ex-farm prices for marine cage and brackishwater pond-cultivated live groupers are about US$ 7.5 - 9/kg. Four species of crabs are of commercial importance in Metro Manila; these are pelagic swimming crab (Portunus pelagicus), mangrove crab (Scylla serrata), peregrine crab (Varuna litterata) and horned ghost crab (Ocypode spp). Mangrove crabs are considered a delicacy and are always marketed alive. 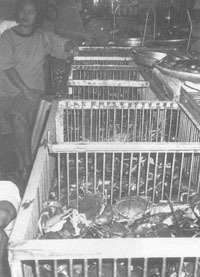 The Metro Manila market is characterised by consumer preference for live mangrove crabs which command high prices; in particular, ripe females fetch premium prices. The domestic market is supplied with mangrove crab the year-round, with a peak season from May to September. During the Christmas period, there is an increased demand and prices of live mangrove crab are relatively higher. Source: Crab traders at Seaside Fish Market, Metro Manila. There is a significant export trade of live mangrove crab to Taiwan and Singapore; Table 4 shows the size grading of live mangrove crabs for export markets. With the increasing demand both from export and domestic markets, the current production has increased significantly to about 4,000 metric tonnes annually. Size requirements of live mangrove crab in the domestic market vary from market to market. The catering sector, particularly restaurant chains and specialised seafood restaurants, prefer small, medium and large sizes; in the retail markets the most common sizes available are small and medium. The minimum commercial size for export purposes is more than 200 g/piece; however, market requirements are oriented toward medium to large sizes, with strong preference for ripe females which fetch premium prices. The relatively high survival rates (5 - 7 days) of mangrove crabs out of the water may be explained based on the fact that they have gill structures that allow adequate levels of oxygen uptake in air. Therefore, local handling methods based on a practical understanding of the crabs physiology are used to minimise capture and transport stress and to cover the overall logistics of export marketing as well as for the domestic trade. Main preventive handling practices for live mangrove crabs include the control of temperature, humidity and careful handling to avoid injuries. There is an important dried fish market in Metro Manila for products such as dried anchovies, dried-salted and salted mackerel, shrimp, squid, cuttlefish and oyster. Small sardines and anchovies are usually brine-salted and dried whole; larger fish are split open, cleaned, salted and sun-dried. Traditional smoked fish products, in particular sardines, mackerel and milkfish are also sold at retail markets in Metro Manila. Speciality cured fishery products such as boneless smoked milkfish are usually sold under several commercial brands well packed in plastic bags; marinated split open and dried milkfish (with garlic, ginger, black pepper, vinegar and salt) is also sold at retail level, especially in the public markets. The domestic dried fish production is significant and the countrys per capita apparent consumption of cured fish (including dried-salted fish) is one of the highest in the region. In addition, locally produced fresh as well as dried seaweed products are also offered in the market. Fresh Caulerpa and Gracilaria seaweeds are usually consumed raw or blanched as the main ingredient in traditional salad dishes or as garnishes for other seafood dishes. Table 5 shows the average retail prices of dried fish in Metro Manila during 1999. The most expensive products were dried squid at US$ 9.4/kg, followed by dried anchovies and dried-salted groupers at US$ 3.2/kg and US$ 2.96 respectively. The cheapest products were dried whole sardines, split dried-salted bigeye scads and Indian mackerel at US$ 2.1/kg, US$ 2.2/kg and US$ 2.3/kg respectively. With population rising and coastal fishery stocks declining, the Philippines is becoming increasingly reliant on imports of frozen fish to satisfy local fish canning industry demand. Canned fish, in particular canned tuna and sardine products, are locally manufactured, while imported canned sardines in tomato sauce are very popular in supermarket chains, public markets and small grocery retail outlets. Metro Manila still boasts a large number of small-scale independent grocery/food retail shops locally known as sari sari stores, that serve mostly neighbourhood clientele and which proliferate in every urban area. Many of these retail outlets sell a wide variety of canned seafood and some cured and fermented fishery products. Sari sari stores and supermarket chains have the largest share of the canned seafood retail market. The consumption habits in Metro Manila vary according to the consumers socio-economic level, with upper and middle income homes buying more high value tuna packs and lower income homes buying low-priced sardine products. The most frequent practice of consuming canned tuna products is either as a salad or with bread (sandwiches); canned sardines and milkfish are usually served with cooked rice or bread as a snack, as well as sautéed with garlic, onions and vegetables. Table 6 shows the average retail prices of canned seafood products in Metro Manila during 1999. In general, canned squid and tuna in oil packs were the most expensive products; the cheapest canned products were sardine in tomato sauce and mackerel in tomato sauce or in oil. Seafood reaches Metro Manila consumers through a multi-level system, which may involve at least three to four transactions before a fish or fishery product is purchased by a consumer in a public fish market, or supermarket, or eaten in a restaurant/food stall. The channels of distribution incorporate locally caught and processed seafood, live and chilled cultured species and frozen imported items from the region and around the world, which can be processed locally. A long chain of traders/middlemen usually distinguishes the seafood distribution chain in Metro Manila, starting from Navotas FPC to the final consumer. Supermarket chains often obtain supplies from direct importers or distributors of frozen and canned seafood products, which makes possible a shorter distribution chain. Metro Manilas urban area is home to a variety of retail establishments offering live, fresh, frozen, cured and canned seafood to consumers. The range of shopping options include public retail markets, supermarkets and street hawkers which offer a wide selection of live fish, fresh fish, frozen and canned fishery products as well as cured and fermented fish. Public markets currently hold a significant share of the retail trade of chilled, live fish, fermented and cured fishery products. Large supermarket chains and medium-sized independent supermarkets offer mainly chilled, frozen, cured and canned seafood. Supermarkets are currently handling a less significant portion of the retail market share for chilled fish and fishery products. The sales of chilled fish in supermarkets are still not significant, because housewives associate fresh/chilled fish with public markets and only grocery goods/canned fish with supermarkets. 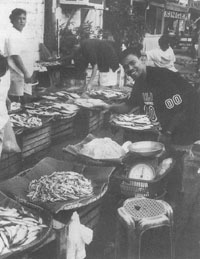 Despite the fact that most supermarkets are low-cost, low-margin, high volume, self-service operations designed to provide the consumers total needs for food and household-maintenance products, there is still a strong preference to shop for chilled/fresh seafood in the public retail markets, and to a lesser extent at street hawker stalls. Most supermarkets have well-defined seafood product sales strategies, including adequate product mix and a variety of frozen, fermented fish products, fish sauce, and canned seafood products. The most popular product form is whole fresh fish and preferred species of seafood are: milkfish, Spanish mackerel, Indian mackerel, all tunas, Loligo squid, round scad, slipmouth, red snapper, groupers, anchovies, sardines, golden Caesio, lizardfish, tilapia, shrimps and mangrove crabs. Recent trends indicate that tilapia (hybrid strains) is increasingly becoming popular in the domestic market, and is now considered as a substitute for milkfish, which is regarded as first-class fish. When comparing retail prices of fresh tilapia with milkfish, currently tilapia is sold at lower price levels, with average retail prices of about US$ 1.7 - 1.9 per kg and US$ 2.57 - 2.69 per kg respectively. Some fish retailers indicated that sometimes both species are sold at the same price level. Table 7 shows the comparative retail prices for fresh fish at selected street seafood markets and public markets in Metro Manila. In general, retail prices at street seafood markets were slightly lower than public markets with a price difference of 4.3 to 12%, however some products like Indian mackerel and hairy shrimp were at the same price level. Taking into consideration that most supermarkets have similar or slightly higher prices than public markets, we can conclude from this relatively limited data that street seafood markets are currently offering slightly lower retail prices for fresh seafood in Metro Manila. Source: Data from field market surveys carried out by the author and counterparts in February 2000. Table 8 shows a comparison of average wholesale and retail prices for selected fish species in Metro Manila for 1999. The estimated market margins for chilled fish ranged from 11.8 to 136 percent, with an average marketing margin of 57.6 percent. Based on the relatively limited data obtained from the field surveys in general, the results obtained were in line with the above marketing margins. 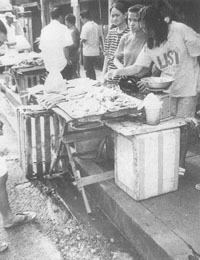 At most public markets, there are full-service seafood stalls in charge of taking and preparing orders from consumers. Preparation may include weighing a specific quantity of fish or shellfish, gutting, cleaning or cutting a whole fish to the desired size or product form. Orders are then wrapped for the consumer in plastic bags. This service is considered as a marketing tool used to maintain the loyalty of regular clientele and attract new customers. Live fish and shellfish, including mangrove crab, oysters, mussels, catfish, snakehead and tilapia, are well-established products in the domestic market. They are sold in simple water tubs, bamboo baskets or cages. Live crab retailers interviewed at the Seaside private fish market indicated that their daily sales range from P. Peso 6,000 to 12,000 and during Christmas, sales could reach up to P. Peso 36,000/day. These specialised shellfish retailers usually operate from 4:00 hours to 23:00 hours, seven days per week. They indicated that their average daily sales comprised 40 to 50 kg of live crab, with an estimated 3 - 5 kg sold in chilled form at reduced prices. The catering sector is also an important outlet for mangrove crab, oyster, mussels, catfish, and tilapia, and recently for giant freshwater prawn. Some restaurateurs indicated strong consumer preference for mangrove crabs, oysters and mussels, traditionally cooked grilled, steamed or fried with vegetables (with coconut milk). Giant freshwater prawn are sold through the catering sector in specialised restaurants including some Thai restaurants operating in Metro Manila. The species is well accepted by local consumers, but there is a need to develop the market and create regular demand. However, supplies of giant freshwater prawn are limited, coming mainly from a few freshwater ponds within Central Luzon. Seasonal variations in supplies and prices of fresh fish are currently affecting demand for fresh/chilled fish and its substitute products. At the retail level, the main substitute product to fresh fish is dressed chicken, followed by pork. When prices of preferred species such as fresh milkfish increase, consumers may shift to dressed chicken or to low-cost species such as fresh sardines, Indian mackerel or round scad, if available. Retail prices of fresh cultivated milkfish and dressed chicken have not increased significantly since 1998 and this trend is basically market-determined. 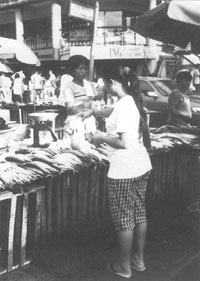 In 1999, a PFDA study of the milkfish industry indicated that relatively lower domestic wholesale and retail prices for milkfish had aggravated the already delicate situation of milkfish producers, who were facing significant increases in the costs of inputs (mainly imported feeds and feed components) and declining demand caused by a drop in consumer buying power. Local production of cultivated milkfish is highly dependent on imported fish meal and other feed ingredients; therefore any significant currency fluctuation or price rise could result in a cost-revenue squeeze with declining profits. Table 9 shows a comparison between available fresh meat, poultry and small pelagics offered in the Metro Manila retail food market in February 2000. Beef was the most expensive animal protein source, with an average retail price of US$ 3.5/kg, followed by pork with an average retail price of US$ 1.75/kg, and chicken with an average retail price of US$ 2.1/kg. Small pelagics such as sardines and anchovy, with an average retail price of US$ 1.2/kg and US$ 1.5/kg respectively, were the cheapest protein source. Public retail markets and supermarkets currently offer a variety of traditional minced fish products and surimi-based products. These products include fish balls, squid/cuttlefish balls, native fish sausages, fish burgers, and surimi analogues. In addition, minced fish-based dried fish/shrimp crackers (locally processed and imported) are also offered. Traditional fish & squid balls and native fish sausages (fish quekiam), and snack type foods, which are consumed mainly deep fried and dipped in sweet and sour sauce, are very popular among consumers. The average wholesale prices of squid balls and native fish sausages varied from P. Peso 78 to 80 per kg (US$1.71 - 1.96 per kg) and P. Peso 60 to 64 per kg (US$1.46 - 1.56 per kg) respectively. The main sources of raw material are from by-catch, market surpluses and some low-cost freshwater species. Besides the above-mentioned minced fish products, value-added products such as cuttlefish/squid/fish/shrimp nuggets and patties and shrimp tempura are locally processed and marketed. Some supermarket chains are also offering pre-packed chilled and frozen imported seafood, including Japanese-style sushi products (e.g. shrimp roe, tuna tekka maki, minced tuna & chilli, crab stick roll). Imported frozen fish (mainly low-cost small pelagics and cuttlefish) are increasingly being distributed in Manilas retail markets at relatively lower prices than locally caught species. During field surveys, it was noticed that imported frozen fish blocks were regularly traded in both the Navotas FPC and Divisoria wholesale markets. This market trend apparently is in response to the increased domestic demand for fish, particularly during the lean fishing season. Therefore, consumers attitudes toward frozen fish are gradually changing; it now appears that frozen fish is considered more desirable, but still not superior to its fresh/chilled counterpart, particularly in terms of its texture. This is a significant change from previous years, when most consumers strongly preferred fresh/chilled fish; frozen fish was not well accepted even if they were the same, or fresh fish prices are relatively too high. In general, these imported frozen fish are currently retailed at prices 15 to 35 percent lower than similar fresh/chilled species. In addition to the regular practice of selling by weight, a kind of pantry service was also available, where fish and fishery products are sold in extremely small quantities and in fractions of the most common units of sale, e.g. sales by small dishes or small heaps. Retail sales of raw food, in particular fresh fruits and vegetables, and fresh cured seafood at busy streets or around public markets by informal vendors in Metro Manila, are an integral part of the Filipino marketplace. These market outlets are locally known as talipapas and according to municipal legislations, are not permitted to operate within a radius of 200 meters from the public markets. However, itinerant street fish vendors peddling from place to place and carrying two baskets for fish display/transport on shoulder poles were not common in urban areas. In the past, Metro Manila was besieged by the problem of street hawkers, sidewalk vendors and ambulant peddlers. Municipal authorities were then authorised to establish flea markets (tiangge) or vending areas in selected streets, roads and open spaces. The municipal ordinance No. 79 - 2 of 1/5/79, issued by the Metropolitan Manila Commission, indicated that the Mayors of the cities and municipalities in Metro Manila were in charge of the design, measurements and specifications of the structures and equipment to be used in these flea markets or vending areas; the allowable distances; the days and times allowed for conduct of the business authorised; the rates of fees or charges to be imposed, levied or collected; the kinds of merchandise, goods and commodities sold and service rendered; and other matters and activities related to the establishment, maintenance, management and operation of the flea markets and vending areas. However, the establishment of such flea markets and vending areas under such terms and conditions was subject to the final approval of the Metropolitan Manila Commission. iv) The change in the role of the Metro Manila municipal authorities, which is operating under difficult conditions, including the negative effects of the economic crisis on the urban poor population. 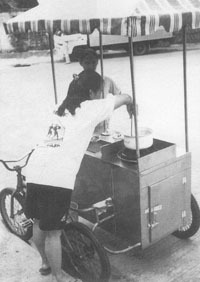 The implementation of a participatory approach and education programmes in street food business, public information campaigns and the recognition of street food marketing as an important informal activity were necessary changes in policy, which helped to clarify the benefits and disadvantages of unregulated street food vending. However, specific interventions (such as adequate training, credit, improved food safety, hygiene and inspection, equipment/infra-structure development programmes and policy formulation to support regulated street food vending) are still confronted by financial problems and lack of adequate manpower for law enforcement. In most cases, it will require some time to gradually implement the necessary changes. Currently the City Council of Metropolitan Manila is planning to regulate street food vending to include the designation of specific areas in the city for vending as well as provision of support to vendors through the construction of inexpensive food stalls (with sanitary facilities). It was observed during field surveys that the fish offered by street hawkers was of acceptable to good quality. Most consumers interviewed at informal street fish markets mentioned that they had a good to acceptable experience with fish purchased there. In addition, it appeared that consumers appreciated the convenience of obtaining readily available seafood at street fish markets. Based on observations, most street fish markets visited were well accepted by consumers and provided personalised services. It was evident that consumers appreciate seafood hawkers, who were in general, knowledgeable about seafood and who cared about the needs of the consumers. Most street fish market outlets surveyed catered to middle and low-income consumers on busy corners of Metro Manila. Low-income families may purchase fish in small lots (heaps/dishes). Based on direct observation and limited survey data, we recognise that convenience, strategic location and affordable prices directly influence repeat purchase of street vended fish, rather than solely customer satisfaction and loyalty. At most street food markets outlets visited, acceptable to fair conditions were observed regarding fish handling practices. 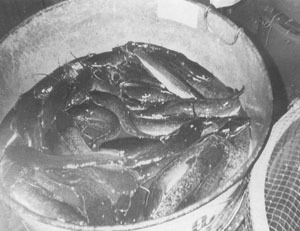 Usually, seafood was displayed without ice; however some small pelagics, shrimp and squid were kept in plastic tubs or trays in a slush of ice and water. Most street fish vendors had at least one insulated box to keep chilled fish with crushed ice and one (1) 10 - 15 litres capacity plastic bucket or container with a cover for storage of potable water for fish cleaning. 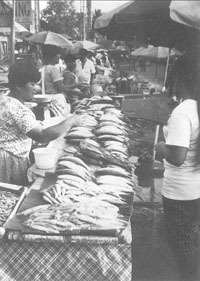 Regarding the variety of fish and fishery products at street markets, most stalls had between four to eight fresh/chilled fish species or 2 - 4 fishery products (mainly cured fish and fermented) on display. Fresh/chilled fish stalls offered only fresh fish, while specialised stalls displayed only cured fish (smoked and dried-salted fish). Most fish hawkers indicated that they handled inventories of fresh fish for one working day, while a few indicated that they kept fresh fish on ice for two days. On average, street seafood vendors operated about 6 to 8 hours daily; most indicated that the average number of working days is about 7 days per week. The average daily sales per stall are about 50 kg of fresh fish and shellfish, 5 - 7 kg of dried fish and 4 - 5 kg of smoked fish. Provision for solid waste to be deposited in bins was inadequate to fair in most street fish market outlets. However in most of the street markets visited, there was not much solid wastes in evidence. Most vendors indicated that they manage solid waste collection and disposal by themselves. The most common procedure was to store wastes in a woven fibre basket or plastic bag which stood without a lid until full. Hygienic conditions could be greatly improved, if adequate potable water supplies (tap water) and solid waste bins with lids could be made available to street fish markets. The use of simple dial metallic thermometers is suggested to regularly measure the temperature of fish on display at street fish markets. Dial thermometers can easily be calibrated to a known temperature by adjusting a hex nut located under the dial. These thermometers were available at some supermarkets and specialised shops. This basic tool could be included as part of the training kit for street fish vendors. In addition, the provision of an adequate wastewater drainage system to street fish market outlets is greatly needed. Water is used extensively in fish markets not only for fish cleaning, but also to flush offal and blood from equipment and floors, and to flume wastewater to floor drains and collection sumps. The first step for the implementation of potable water supplies (tap water) to individual stalls at street fish markets should be to analyse water use patterns, install water meters and regularly record water consumption. The next step should be to undertake a survey of all market area and ancillary operations to identify wasteful practices and undertake corrective actions. Each street fish vendor should pay according to their water consumption and proportionally for the provision of wastewater drainage systems. Taking into consideration womens predominant role in street fish marketing, greater female participation in training activities in the fields of small business management, fish handling and marketing should be encouraged. The principal challenges with regard to informal street fish vending in Metro Manila are therefore the need for effective and sustainable interventions and the formulation of a comprehensive policy. To be effective, statutory requirements (including licensing), should be properly linked to training, monitoring, supervision and equipment/infrastructure development programmes. In particular, seafood street vending should have adequate provision of basic facilities for handling, chilled storage, preparation and waste disposal which can be provided in the street areas where seafood vendors regularly operate. In addition, depending on the type of seafood prepared and sold (e.g. chilled raw fish and cooked fish/squid balls), working hours, working places, and modus operandi (with fixed stalls or itinerant vendors with push carts), vendors may require other equipment and facilities. They may also have different views regarding proposed improvements of their services and facilities. The views of street fish vendors and their clientele should be taken into account during the formulation of statutory requirements and legislation applicable to street fish vending. Sanitary regulations and codes of practice for street seafood vending should be drafted using simple non-technical language, and if possible, well illustrated versions of these regulations in both English and Tagalog should be prepared for training purposes and the information disseminated. Regular training courses on fresh/chilled seafood handling and hygiene should be part of any development programme for street fish vendors organised by the City Council of Metro Manila or Metro Manila Development Authority in co-ordination with the relevant government agencies. This training should be aimed at providing adequate guidance and technical assistance to fish hawkers on proper seafood handling and personal hygiene practices. All stall holders and their assistants who are involved in the preparation and sale of seafood should be required to attend and pass this training course. Introduction to the concepts of freshness, quality, wholesomeness and nutritive value. The care of live and fresh fish, handling methods, use of ice, receiving deliveries, quality inspection, storage of live and chilled fish; hygiene and sanitation for fish retailers, selection and application of detergents and disinfectants. Quality of fish and quality aspects at retail level; assuring seafood safety at street fish markets; retail display of fish; promotion of fish sales techniques. Avoiding bad marketing practices. National and municipal regulations and codes of practice for seafood vending. Introduction to business planning and simple economics in fish retailing. Equipment and facilities development programmes for street fish vending. In addition, ready-to-eat seafood vending is a flourishing small-scale business in Metro Manila, which requires adequate training for vendors to improve safety and reduce the risk to public health from poor quality products. Training programmes should focus on improving hygienic conditions at the point of sale, use of potable water, and assuring overall safety of popular street-vended snacks/dishes. Figure 3 illustrates the layout of a typical street market food outlet (talipapa) located in Cubao District, Quezon City. At this outlet, about 65 stalls were in operation, of which some 19 stalls were selling fresh and live fish and shellfish (live mussels and oysters) as well as cured fish. 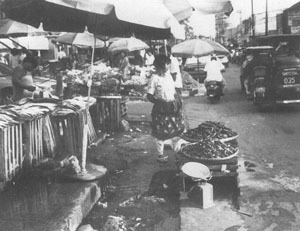 Most fresh and live fish stalls were concentrated in the 15th Avenue area and a few were along First Camarilla Street. Considering the significant area occupied by this street market and the variety of food items offered, we can conclude that it is an important outlet in comparison to other markets visited. The layout of another typical street food market outlet (talipapa) located in Project 3, Quezon City, is illustrated in Figure 4. About 18 stalls were there, of which 12 were selling either fresh or live fish and shellfish or smoked fish. Most stalls were concentrated in Molave Street, with some chicken and fresh pork and meat vendors operating in Narra Street. This appears to be a medium size market outlet (with few food items offered) in comparison to other street markets visited. Most vendors interviewed in both street markets indicated that their daily sales were about 50 kg of fresh and/or live fish, 5 - 6 kg of dried-salted fish and 5 - 8 kg of smoked fish. 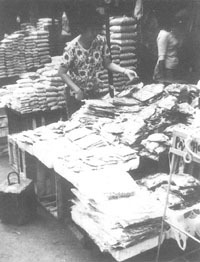 The preferred source of fresh fish in both street markets was the Farmers Market in Cubao, and the main source of cured fish and minced fish products was the Divisoria wholesale market. The street markets in Manila are usually located around public markets or busy corners of main streets. According to all street fish vendors interviewed in the Quezon City area, there is no fixed opening time for street markets, taking into account that they are considered as illegal vendors. However, in most of the markets visited, vendors indicated that they usually operate from 13.00 hours to 20.00 hours, seven days per week. The solid wastes were regularly collected by the street vendors and placed in plastic bags for further disposal. Street vendors were in charge of the cleaning of their working area after market hours. The basic equipment of a street fish vendor consisted of small wooden tables, a wooden cutting board, trash bin, umbrella, water for washing fish and cleaning the stall area, insulated boxes, weighing scale and plastic display dishes. Most of the smaller stalls were equipped with only secondhand wooden packaging crates as a framework for wooden tops, or round flat bamboo/rattan trays for fish display, weighing scale and cutting boards. The typical sales or table area per seafood retailer would be in the range of 1.5 to 3 m2. The larger stalls use up more space to keep insulated boxes that may not fit below the wooden tables. The most common material used for manufacturing the round display trays was rattan. 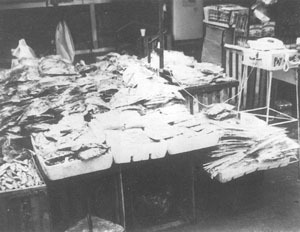 In most locations visited, retailers displayed their fish on wooden tops lined with plastic sheets; in some stalls, whole Acetes shrimp, small pelagics or squids were displayed in small plastic dishes (on top of the tables) and sold by the dish (volume). Some vendors, operating in the outskirts of Metro Manila, were offering live freshwater fish and shellfish, mainly snakehead, catfish, mussels and oysters. 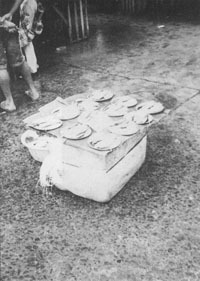 Basic equipment for live fish sales consisted of metal tubs or plastic bins filled with water, weighing scale, round display trays (rattan) and chopping boards. Mussels and oysters were displayed on round display trays and kept moist with regular sprinkles of seawater. 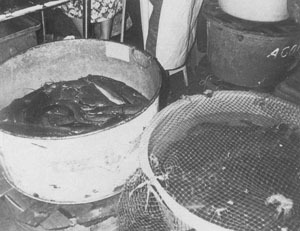 Snakehead and catfish were displayed in metal tubs or plastic bins filled with freshwater. In general, green mussel was the predominant species offered in live form; this was available in most of the street markets visited. According to most vendors, the sales of mussels and oysters are regularly affected by red tide. As a result, the Government sometimes imposes a complete ban on the harvesting and sales of these bivalves in the interest of public safety. These bans negatively affect marketing operations and the livelihood of street fish vendors specialised in live shellfish vending. In contrast to the considerable emphasis on modern food vending equipment in outlets which cater to the middle/high income consumers, very little consistent effort is directed for the benefit of low-income consumers. It remains a fact that much technology and expertise exists locally today, which, if adapted to the needs of the low-income sector, could play an important role in improving and streamlining the safety and quality of ready-to-eat street seafood. Among the major deficiencies observed during field surveys of traditional street fish/squid balls vendors in selected areas of Metro Manila, were the lack of basic facilities (running potable water for hand washing, cleaning worktops and utensils), and limited access to refrigerated/chilled storage for their daily stock of fish balls. 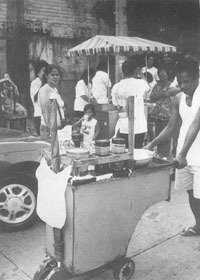 A successful pilot scheme on food carts for street food vending sponsored by the Food and Nutrition Research Institute in co-ordination with other local agencies/institutions was implemented in San Juan, Metro Manila and Los Baños, Laguna during 1996. It provided improved food cart prototypes to selected street food vendors on a rent-to own basis and a flexible payment scheme which considered the prevailing street vendors payment capabilities. The prototypes were locally constructed and the cost ranged from P. Peso 3,500 to 4,200. This scheme was aimed at field testing two models for integrating the street food system into feeding operations in selected urban schools. However, during the field work, there was insufficient technical information available on the design and materials used for the construction of these improved food cart prototypes to allow a proper analysis. A good example of improved equipment locally developed for the retail of fish/squid balls and native fish sausage (fish quekiam) was identified by the field survey team in Quezon City area. This improved pushcart (locally known as carreton) was an initial attempt by a local propane gas company to focus attention on development of low-cost equipment (see next section). It was technologically-based and motivated by a desire to improve the traditional preparation and retailing habits of local vendors and as well as promote the safe use of propane gas. In Metro Manila, street vendors of fish balls traditionally prepare and retail their products using poorly designed wooden pushcarts. According to the improved pushcart operator, the fish balls and fish quekiam stock is kept in a home refrigerator. During trading hours she uses an insulated box to store the fish/squid balls and fish quekiam. Street vendors should be advised not to store fish balls for more than three (3) days under chilled storage conditions and to cook them thoroughly before selling them to their clientele. A research study suggested that fish balls were included among the ready-to-eat food items sold by Metro Manilas street food vendors, which were associated with the risks of cholera infection. However, that research study concluded that only pansit (rice noodles with shrimp, meat and vegetables), mussel soup and the absence of piped water at home remained as risk factors associated with cholera transmission in Metro Manila. Infrastructure requirements for fish balls vending to ensure that they are hygienic and safe, will depend on whether the fish balls were prepared at the vendors home or purchased semi-prepared (ready-to-fry) for completion at the point of sale. According to the results of the field surveys, most of the fish/squid balls were processed elsewhere and purchased at wholesale markets by vendors. At wholesale level, it was observed that most fish/squid balls and quekiam were adequately packed in plastic bags, and kept either chilled or frozen. Therefore, the main concerns were the storage conditions of fish/squid balls after purchase and during the time of storage. Refrigeration/chilled facilities for traditional street seafood vendors were very limited and were not normally encountered among these vendors during field surveys. However, block ice was very accessible in Metro Manila; it is widely used by street vendors to cool soft drinks and for preparation of a traditional delicacy called halo halo (crushed ice mixed with chopped fruits, milk and ice cream). The improved pushcart prototype was constructed locally by a propane gas company, using stainless steel sheets for the body and a stainless steel angle frame. The heating system consisted of one cooking stove, constructed of angle iron frame and fitted with one burner and gas storage tank with a manual safety on-off valve. The main body was attached to a bicycle with one turnable and two fixed wheels. A canvas cover with a metallic pipe frame was fixed to the main body for protection against rain and sunshine. This pushcart has significant advantages over the traditional carreton, which uses kerosene-cooking stoves for frying fish balls and are considered more prone to accidents due to malfunction. It had a well-designed gas cooking stove with a protective surface against strong draughts, thus avoiding disturbed combustion. The manufacturer has paid particular attention to the necessity for regular inspection and maintenance of this equipment, particularly of safety devices, in order that they may be relied upon to give adequate service to the user. The gas storage tank was located far away from the heated area of the pushcart and it was easy to detect any possible gas leaks. It also included adequate storage space below the worktop which was used to keep an insulated box for chilled storage of fish balls/squid balls during the trading day. ii) Maintaining the fish balls in high value condition longer, thus reducing losses and spoilage. iii) Reducing the risk to public health from poor quality products; improving hygienic conditions at the point of sale; improving the safety of street-vended fish/squid balls and native fish sausage (fish quekiam). This street seafood enterprise can be characterised as small-scale, requiring relatively simple cooking and administrative skills, a small amount of initial capital to start the business and only basic facilities at home for storage of raw materials and preparation of sauces. The main capital input required comprised the purchase of the improved pushcart; this was done through a special credit arrangement with the propane gas company, with a small down payment and regular monthly instalments. This scheme was initially aimed at assisting the development of small-scale fish balls businesses among family members of the propane gas companys employees, thus ensuring adequate repayment. 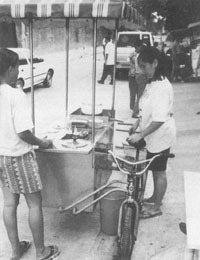 The interviewed owner and operator of the improved pushcart can be characterised as a casual street vendor selling fish balls as a supplement to other activities. ii) Organising all needs including regular wholesale purchases of fish/squid balls, native fish sausages (fish quekiam), ingredients for sauce preparation and non-returnable packaging materials at Divisoria wholesale market or making arrangements with a wholesaler for regular deliveries of purchase orders (the squid balls & quekiam vendor interviewed indicated that she had an arrangement with a wholesaler for deliveries twice a week). Organising for adequate chilled storage of raw materials to avoid spoilage. Arranging practical training in the use of equipment and cooking techniques. Cleaning schedules for all kitchen utensils and the pushcart. iii) Controlling of staff and products and preventing pilferage as well as improving performance. It is important to check that fish/squid balls and fish quekiam is of the right standard, (that is to say the correct quality and quantity); checking to prevent waste and that the staff operates the cooking stove properly. Checking that the cooking times are correct, avoiding undercooking or excessive shrinkage due to overheating. 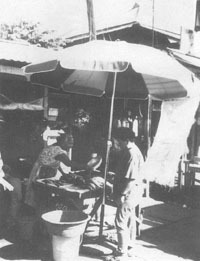 In general, vendors start preparing fish/squid balls or quekiam once the clientele has placed their orders; tried products are normally not kept on display. Sweet and sour seasoned vinegar and traditional sauces are prepared at home at least every two days. For each trading day, small quantities of fresh sauces are placed in plastic dispensers or glass bottles and the leftovers are removed at the end of the day. iv) Understanding the preferences, eating habits, purchasing behaviour and needs of the consumers to encourage repeat purchases. Therefore, lastly and perhaps most important, a good knowledge of the target market is a great asset, to be able to formulate simple marketing tactics. A brief analysis of the competition, namely small low-cost restaurants (locally known as carinderia) and fast food chains is of some importance. For example, the apparent declining sales in restaurants and fast food chains in Metro Manila since 1998 (due to the economic crisis and consequently lower consumer demand) had positive effects on the sales of street food. As we can easily figure out, the main target market comprises the younger sector of the population, including students and workers looking for low-cost, tasty and convenience snacks. We must realise that lower income consumers (D and E socio-economic class) represent about 65 - 70 percent of the population in Metro Manila and they may be looking for low-cost seafood products. Small-scale enterprises offering inexpensive seafood products should consider marketing strategy clearly identifying their seafood products as meant for price-conscious consumers. v) As a marketing tool, the sales of soft drinks and the traditional delicacy locally known as halo halo, helps to provide consumers with a wider variety of products, which combine well with the main seafood products offered. In the case of the improved pushcart operator interviewed, she mentioned that she could offer these additional products, considering the fact that she currently places her selling point in front of her home, placing some wooden benches for consumers to sit and enjoy her products. The halo halo snack is prepared at her kitchen, under good hygienic conditions using her domestic refrigerator (with a freezing compartment to keep ice) to store all ingredients. The operators home had a well-designed kitchen with potable water supply and suitable facilities for hand washing, and washing dishes and utensils. In addition, suitable sanitation and waste management facilities were observed at her selling point. Disposable paper plates and bamboo sticks were used for retailing fish/squid balls and quekiam; returnable glass cups used for retailing halo halo were well cleaned with running water and detergent and looked tidy and clean. The estimated investment costs of the improved pushcart prototype for street vending fish/squid balls and quekiam are shown in Table 10. The major investment cost consists of the pushcart itself which is about US$ 367, representing 95 percent of the total investment cost. The operator of this improved pushcart indicated that her daily gross sales was on average, P. Peso 500 to 600 and a daily gross income of P. Peso 300; currently she was only operating 4 - 5 hours/day and 5 days/week. A daily gross income when operating 8 hours/day was estimated to be about P. Peso 350 to 480. Average retail prices of squid balls and quekiam were P. Peso 2 and P. Peso 1 per piece respectively. The average daily sales were 2 - 3 kg of fish balls and 3 - 4 kg of quekiam. Her target market consisted of mainly middle class consumers (but also included some D class consumers), in particular, students and housewives, as well as government workers. Based on the assumption of an average daily gross income of P. Peso 400/day and operating 7 days/week, the expected monthly gross income would be P. Peso 11,200. After accounting for labour costs, electricity, propane gas, ice, raw materials and equipment depreciation at P. Peso 4,800, it is expected that monthly net revenues of the improved pushcart would be about P. Peso 6,400. Assuming that a loan is taken for capital expenditure on the improved pushcart, the repayment period would be about 10 months, with monthly instalments of P. Peso 1,500. Improved pushcart, with stainless steel body, including propane gas stove. Challenging conventional wisdom about the informal sector, this example documents street fish and fishery products vending as an economic activity that produces an income ranging from minimum wage to higher than average income depending on the ownership, working schedules and market strategies used. It is important to note that most successful street ready-to-eat fish/squid balls vendors work in the trade for a lifetime, but there are also a few casual street vendors selling as a supplement to other activities. v) Provision of consumer education programmes to create awareness on the nutritional quality and safety of street seafood vending under the proposed improved scheme. Domestic manufacturers, using local resources and materials can make low-cost improved pedal-powered equipment and pushcarts. In addition, the manufacture and maintenance of this low-cost equipment can provide employment and their use will provide safer ready-to-eat fishery products at a low investment cost. Figure 5. Fresh fish display at a street fish-retailing stall. Quezon City, Metro Manila. Figure 6. Typical display of live mussels at a busy street food market. Metro Manila. Figure 7. Typical display of fresh fish at a busy street corner. Quezon City, Metro Manila. Figure 8. 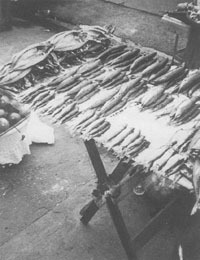 Overall view of a typical street fish-retailing stall. Metro Manila. Figure 9. 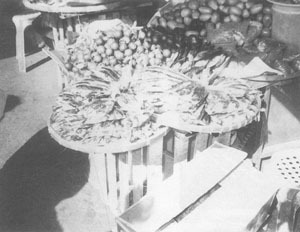 Overall view of a street fresh fish retailing stall using traditional bamboo display trays and banana leaves. Quezon City, Metro Manila. Figure 10. Typical display of live mussels using traditional bamboo trays in a busy street. Metro Manila. Figure 11. 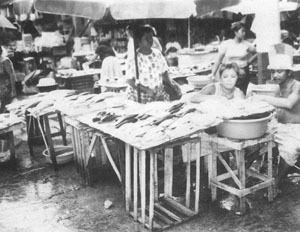 Improved portable display table used for fish retailing at a street food market outlet. San Pedro, Laguna, Metro Manila. Figure 12. Fresh fish display using slanted wooden platforms at a street food market. Quiapo, Metro Manila. Figure 13. 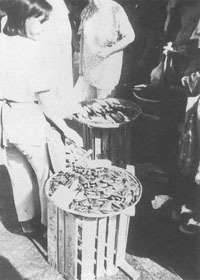 Overall view of a typical large-size street stall selling dried-salted and smoked fish at a busy street. Quiapo, Metro Manila. Figure 14. Display of dried-salted and smoked fish in a street food market stall. Quiapo, Metro Manila. Figure 15. Display of dried-salted and smoked fish using traditional trays at a street food market. Quezon City, Metro Manila. Figure 16. Typical display of fresh fish on small dishes at a street food market. Metro Manila. Figure 17. Traditional wooden pushcart used for street vending squid and fish balls. Quezon City, Metro Manila. Figure 18. 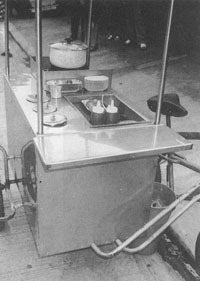 Overall view of an improved pushcart equipped with gas stove for street vending of quekiam, squid and fish balls. Quezon City, Metro Manila. Figure 19. Side view of the improved pushcart, equipped with a bicycle. Quezon City. Metro Manila. Figure 20. Deep-frying of squid and fish balls using the improved pushcart. Quezon City, Metro Manila. Figure 21. 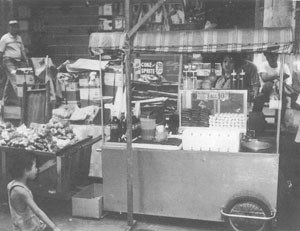 Display of fish quekiam and squid using an improved stationary pushcart operating in a busy street. Quiapo, Metro Manila. Figure 22. 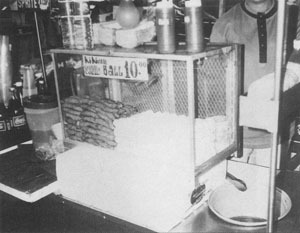 Overall view of an improved stationary pushcart vending fish quekiam and squid balls. Quiapo, Metro Manila. Figure 23. Street fish vendors folding trestle table used for fresh fish retailing. Metro Manila. Figure 24. 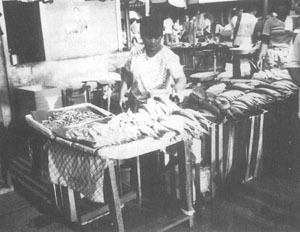 Street vendors folding trestle table used for dried-salted and smoked fish retailing. Metro Manila. Figure 25. Galvanised iron round containers (bañeras) used for live fish storage, marketing and distribution. Navotas, Metro Manila. Figure 26. Typical wholesale display of live catfish using traditional bañeras with a nylon mesh cover. Navotas FPC, Metro Manila. Figure 27. 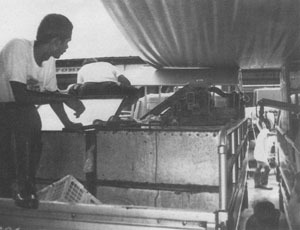 Side view of a live fish storage system mounted on a truck used for live milkfish distribution. Navotas, Metro Manila. Figure 28. Typical live fish unloading operations from a vivier truck to the wholesale auction hall. Navotas FPC, Metro Manila. Figure 29. 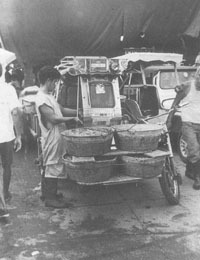 Front view of the loading operations of fresh fish in bañeras onto a low-cost transportation tricycle. Navotas FPC, Metro Manila. Figure 30. 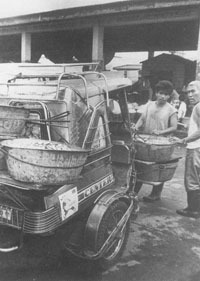 Side view of a tricycle loaded with fresh fish for distribution to retail markets. Navotas FPC, Metro Manila. Figure 31. Display of live mangrove crabs using locally made stainless steel cages. Seaside fish market. Metro Manila. Figure 32. 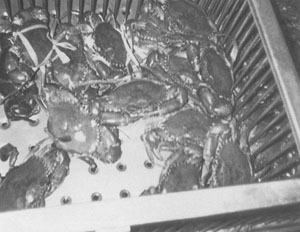 Overall view of the storage of live mangrove crabs at a specialised retail outlet. Seaside fish market, Metro Manila. Based on population projections for the Philippines, by the National Statistics Office, 1995. Based on the total midyear population data for the year 2000 (81,159,644 inhabitants); international database of the US Bureau of the Census, International Programs Center. (http://www.census.gov). Association of Southeast Asian Nations (ASEAN), with the following member countries: Brunei Darussalam, Cambodia, Indonesia, Laos, Malaysia, Myanmar, the Philippines, Singapore, Vietnam and Thailand. Press release, January, 2000, Bureau of Agriculture Statistics, Philippines. 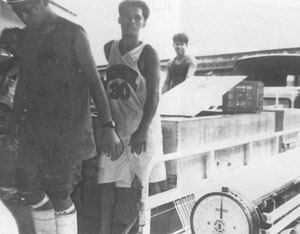 A Situationer of the Bangus Industry in the Philippines by Ramon Caindec, 1999. In February 2000, the rate of exchange was US$ 1.00 equal to 40.87 Philippine Peso (P. Peso). Cholera in Metropolitan Manila: foodborne transmission via street vendors Bulletin of the World Health Organization, 1994, 72 (5): 745-749, by Lim-Quizon, M.C., et. al. There are several socio-economic classifications of Filipino homes being used; mostly classifying homes into four groups, namely: class A and B (upper class), C1 and C2 (middle class); D (lower class) and class E (extremely low class).